Board member Wayne Bagley wanted to know if the Board was going to give the rights of way and easements for the two entrances to the county or charge the county for them. He also questioned whether the Board of Education should act now as requested or wait until the Board of Commissioners gave its formal approval of the plans for the project. Board Member Kim Argo questioned whether the county would get the work done before school started in August and whether the roundabouts would make the problem of congestion of the school better or worse. Board Chair Tom Odom said he would refrain from even asking questions about the county’s request. The comments by the Board members were in response to a report at the Board’s work session on Monday by Brock Toole, chief operating officer for Oconee County Schools. 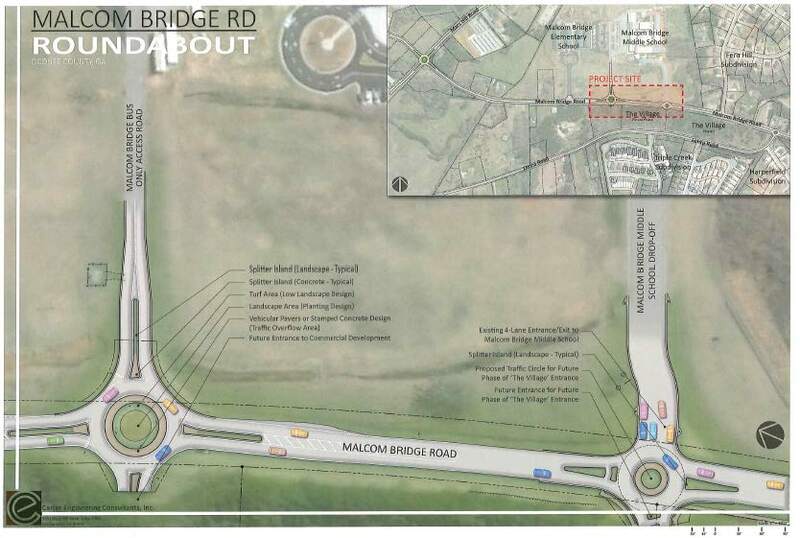 Toole told the Board that he would be asking it at its next meeting on April 15 for it to approve granting to the county permanent rights of way and temporary construction easements for the two roundabouts on Malcom Bridge Road. One of those entrances is at the bus and faculty entrance and the other is at the parent entrance. Toole said the Oconee County Board of Commissioners had requested the Board of Education grant the rights of way and easements so it can go forward with the project. Before Toole could finish, Bagley asked if the Board of Commissioners had already voted on the project. Toole said it had not but would do so on June 4. “I assume we won’t be giving them this right of way until they vote to approve it?” Bagley asked. Toole said the vote was on June 4. “And we won’t provide them with the right of way until they vote?” Bagley asked again. Superintendent Jason Branch said the Board of Education could approve the legal documents at its meeting on next Monday as proposed by Toole or at its regular meeting in May. That figure was $52,000, he said. Toole also said Board of Commissioners had agreed to pay to move and rebuild the school sign. “No gas lines out there, right?” Bagley asked. “Not to my knowledge,” Toole said, though he said utility location had not yet been completed. Toole’s response produced a big smile from Bagley and other Board of Education members. The question about the gas line was a reference to the construction of the entrances to the Dove Creek Elementary School on Hog Mountain Road in the western part of the county. The county identified an old, high pressure gas transmission line on the edge of the Dove Creek property. Superintendent Branch said the school system did not know of the gas line when the Board of Education purchased the site. The county said the gas line needed to be moved and upgraded before it could build the entrances. The county is responsible for roadway construction for county schools. Bagley disputed the need to relocate the lines and criticized the county for its work on the project. In the end, the relocation of the line and construction of the entrances was not completed in time for the opening of Dove Creek last year. 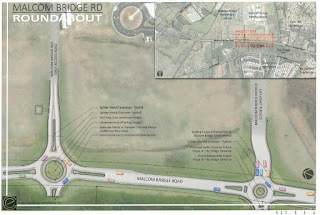 “And they think it is going to be through by the time school starts?” Board member Kim Argo asked Toole about the Malcom Bridge roundabout construction. “I hope so,” Argo said, laughing. “Yes sir, that is correct,” Toole responded. “We’re not funding any component of it, and we’re not overseeing the construction of any of it?” Burgess continued. “By granting them this property we’re simply enabling them, being a good steward, and enabling them to do the project that they decided that they think they need to do and that they are going to construct. “I’m raising that point publicly,” Burgess said, “because I’ve gotten emails and you all may have gotten the same that apparently, in some of the hearings that were done months ago about this project, some of the people were led to believe that it was the Board of Education that was deciding to do this and the decision of us to allocate the right of way was our acquiescence and agreement that that needed to be done. Board Chair Odom was the next to speak. “By doing these roundabouts, they’re minus two security officers, is that correct?” he asked. Toole replied that two sheriff deputies who now work at the entrances would no longer be on site. “It will be interesting to see what dismissal time and arrival time, how it impacts it,” Argo said, smiling. “Are we donating the right of way?” Bagley asked. Toole said that was the request. “I’ll decline to ask any more questions,” Odom said, ending the conversation. The discussion of the two roundabouts at the school entrances as well as one at Mars Hill Road and Malcom Bridge Road and another at Malcom Bridge Road and Lenru Road first became public last year. In October, the Board of Education agreed to a request by developers of a shopping center at Malcom Bridge Road and Lenru Road to modify the details of that development. An entrance to the shopping center is opposite the parent entrance to Malcom Bridge Middle School. As a condition of that rezone modification, the Board required the developer to provide rights of way for a roundabout at that intersection as well as at the intersection of Malcom Bridge Road and Lenru Road. The property had been rezoned for a shopping center in 2004, and the developer did not need Board of Commissioner approval for construction consistent with those originals plans. Only William “Bubber” Wilkes from the current Board of Commissioners was on the body that approved that original shopping center rezone in 2004. Claire Buck, chief academic officer for Oconee County Schools, updated the Board of Education on Monday on the work for the creation of a five-year Strategic Plan for the school system. She reminded the Board that about 400 people attended the Community Engagement Session held in September, that she had received 267 responses to a subsequent survey, and that 38 people had attended a planning team meeting in November. Buck said that 29 people making up what she called an Action Team met from January through March to develop 12 performance objectives and four goal areas as part of that Strategic Plan. The goal areas are Teaching and Learning, Community Engagement and Partnerships, Culture and Climate, and Operations. She said Culture and Climate is not in the current Strategic Plan but that the Action Team felt it should be a new goal, based on the input it had received through the Strategic Plan process. The performance objectives include such things as Provide High Quality Professional Learning, Increase Family Engagement, Support the Well Being of Students, and Proactively Address District Growth. Buck said she will ask the Board of Education to approve the 12 performance objectives and four goals at its meeting on April 15. Anisa Sullivan Jimenez, director of Communications for Oconee County Schools, told the Board on Monday that 10 students from Oconee County Schools had been named finalists for the Governor’s Honors Program, a residential summer program for gifted and talented high school juniors and seniors. The program is operated by the Governor’s Office of Student Achievement and will take place from June 16 to July 13 on the campus of Berry College in Rome. More than 3,000 students from across the state were interviewed and auditioned over three weekends in January and February, and from those nominees around 700 finalists were chosen to participate in the 2019 program, Jimenez said. The program is fully funded by the Georgia General Assembly, and there is no charge for students to attend, according to Jimenez. Students will spend the morning in their major area of nomination. During the afternoons, students choose one of the other areas in which to study. Evenings are filled with seminars, activities, concerts, and performances. Jimenez released the names of the finalists for the Georgia Governor’s Honors Program on Tuesday. From Oconee County High School, the finalists are: Alexandre Benoit, Science; and Emma Newberry, Oconee County High, Agricultural Research. Finalists from North Oconee High School are: Angele Chen, Visual Arts; Piper Cyterski, Social Studies; Cassandra He, Mathematics; Caroline Hedrick, Theatre; James Jutras, Music: Trumpet; Caleb McArthur, Theatre, Grace Pan, Mathematics, and Ryan Yang, Mathematics. 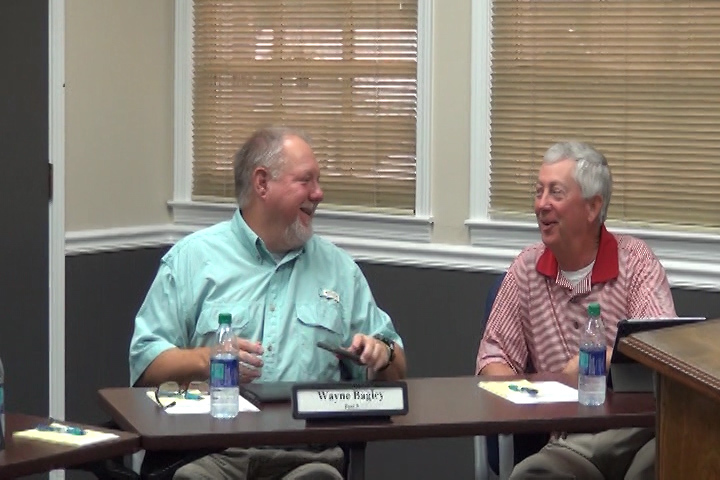 The video below is of the April 8 meeting of the Board of Education. Toole made his report on the roundabouts on Malcom Bridge Road at 16:41 in the video. Buck gave her report on the Strategic Plan at 5:18. Roundabouts are a good thing. Those who are concerned should do a little research before opposing. They work. Is this going to be a single lay or multi-lane roundabout? I can't see how three roundabouts in a mile are going to improve traffic that already requires two cops to direct. Where do we stand as far as building roundabouts? Looks like France has the most roundabouts. Here in the US Carmel, CA boasts the most. Will they move traffic safely and quickly? Lots of viewpoints. The jury is still out. However, the article does touch on an important issue of concern. The overreach of the BOC toward the BOE. A smoother discussion may have occured if a third party report was conducted. And I don’t mean the construction & design company the BOC hires. A BOE Representative only delivered the BOC message. Just a thought. Bit by bit the BOC lead by Daniell appears to disregard the public and now an elected board in the decision making process. Someone may want to rethink this one. The BOC may or may not be building roundabouts, but they are surely building a wall between folks. The diagrams, which were provided to me by the county, show a single car in the roundabouts, suggesting a single lane. I don't see how single lane roundabouts are going to help when people have a hard time playing nice in the lanes going into the school and letting people into the lane to let their kids out.